This is a very quick (if you have an electric hand mixer), very simple recipe here that I got from the book The First 40 Days. This is my first time making coconut haystacks the more traditional way as I have been making the raw version, that I call Rawcaroons, for years now. I have a basic version, the almond rawcaroon, a lemon one, raspberry flavor, and there are probably a few other flavors in my recipe repertoire as well, if you are up for the search 🙂 I have definitely made many more flavors just cannot remember if I have blogged about them all. While I LOVE the raw versions, they can be heavy on the digestion and they take so much longer to make. Since I am still in my early post partum days I am continuing to be mindful of my digestion and choosing foods that feel gentle and not to heavy. These were wonderful! They don’t hold up as nicely as the rawcaroons as they are more fragile, but so worth it! I hope you enjoy! Gently mix in all other ingredients until just combined. Do not over mix! Remove from oven when done to your liking and let cool 5-10 minutes. These are the perfect snack for me to have around the house for a quick pick me up or little treat with my tea. I do not make these desserts too often anymore but when I do I put all my heart into them and this one reflected that in it’s beautiful flavor combinations. Don’t let the extensive list of ingredients scare you off, this cheesecake is worth every single bite!! Sorry for the poor photograph. This cheesecake came out of the fridge right before serving to a bunch of friends and I didn’t take that time to take a better picture of the whole cake. while the food processor is running, scant some water until it starts to get a tiny bit sticky. You might not need both TBS. If you used very sticky dates you might not need to do this. press this mixture at the bottom of springform pan that you have lined with wax paper. This will make taking out the cake at the end much easier. put in the freezer for one hour to set then transfer to fridge until ready to eat, about 4 hours. Because I had made it the night before, I put it back in the freezer for 45 minutes before serving. OR make a sauce for the swirls before putting int he freezer. now put it in the freezer for one hour to set then transfer to the fridge. Decorate as you wish and share the love!!! Another persimmon pudding? Yes. I am shamelessly posting another persimmon pudding recipe. Mostly because I just made this today, faster than it took my boys to destroy the living room. That’s how quick this recipe is! And also because I love persimmons and my husbands client just gave us a huge bag of the Hachiya kind, which are the ones that need to be super ripe before eating, which means the best way to eat them in my opinion is prepared, not just as is, as they are so messy when they are ripe enough. blend on high, serve and enjoy! Delicious caramel free of refined sugars, butter and health concerning ingredients? Ummm yes please! 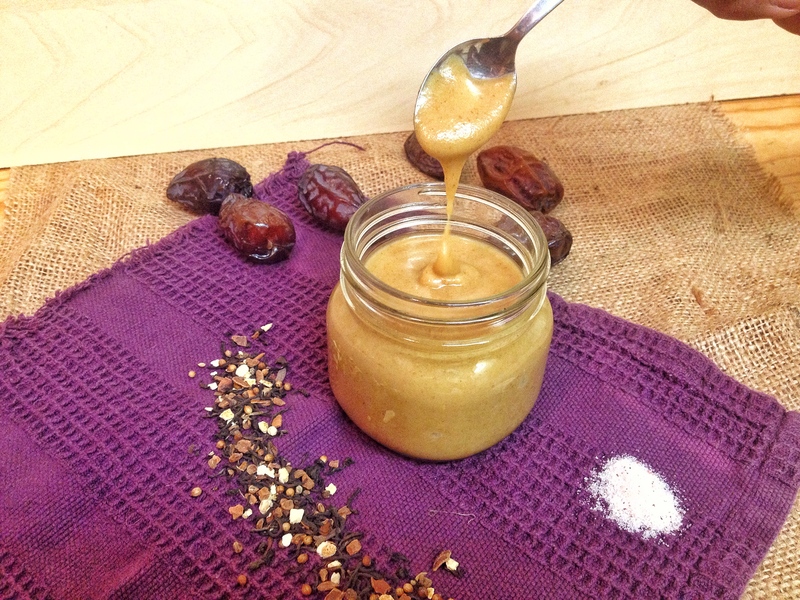 Creamy and sweet, with a hint of saltiness paired with the subtle chai tea flavors make this caramel sauce a winner in my sweet indulgences lately. Not only that, but it is (almost) raw, vegan and super quick to make! I’ve had this caramel in some almond milk for a sweet drink, on top of homemade ice cream, with strawberries dipped in it, but mostly just out of the jar with a spoon. This sauce was an accident. I had set out to make some chocolate creation. After putting the dates, mesquite and coconut oil in the blender, I realized that I was out of cacao powder (gasp!!!) How did I let that happen?? AND I was out of almond milk. I was sipping on some chai while I was making this, so I figured I would use that to get the blender going. After tasting it I quickly recovered form my chocolateless upset. It was delicious. Salt came to mind very quickly and in a matter of seconds the blender was going again to create this beautiful concoction that I have made a few times already. While I am proud of my creation, I must admit, it’s hard to screw up when using such wholesome and delicious ingredients. This fruit compote is packed with flavor and texture. 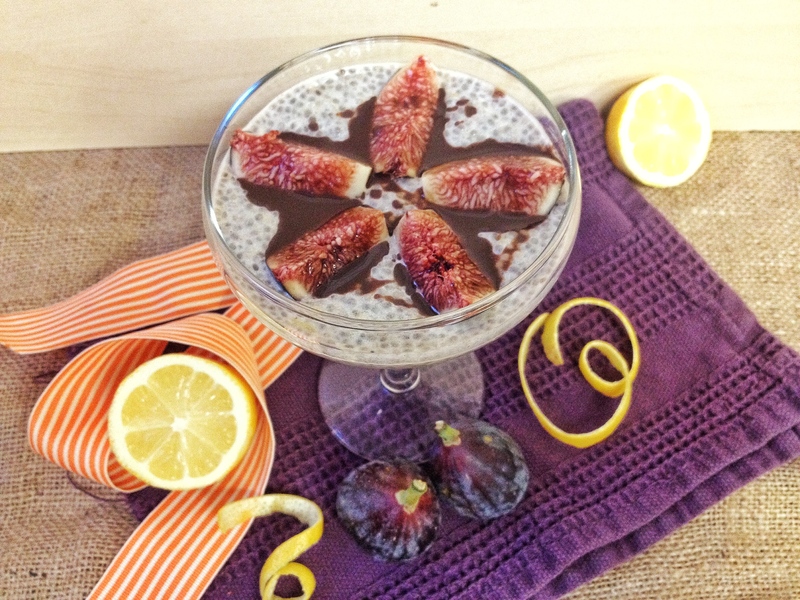 After scoring a huge box of fresh figs, I already had a few recipes in my mind of what I was going to do with them. But this wasn’t one of them 🙂 This idea came about when I had a bunch of strawberries that needed to be used up very soon. 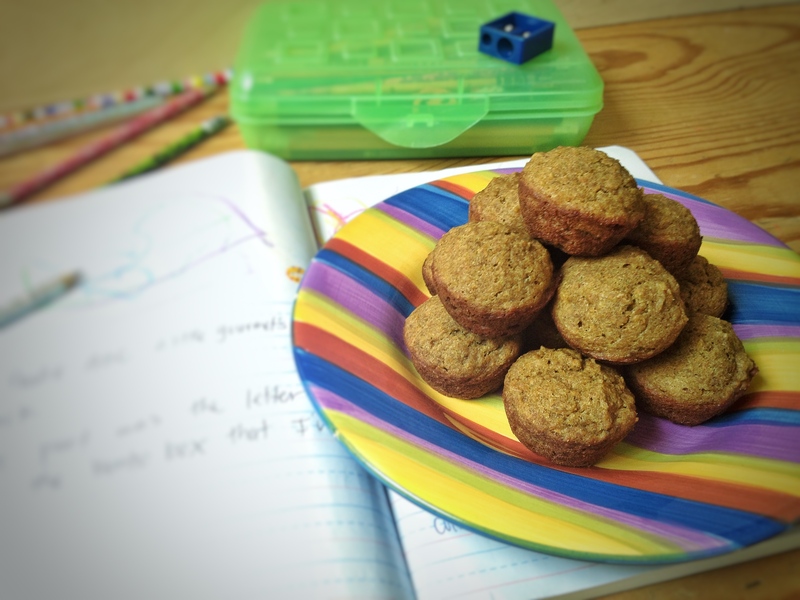 While I generally choose to eat my fruits raw, every now and then I enjoy cooking them to switch up the flavors a bit and also to bring something interesting to my kids. Cooking these fruits really brings out their sweetness and flavors. use it how ever your imagination wishes! 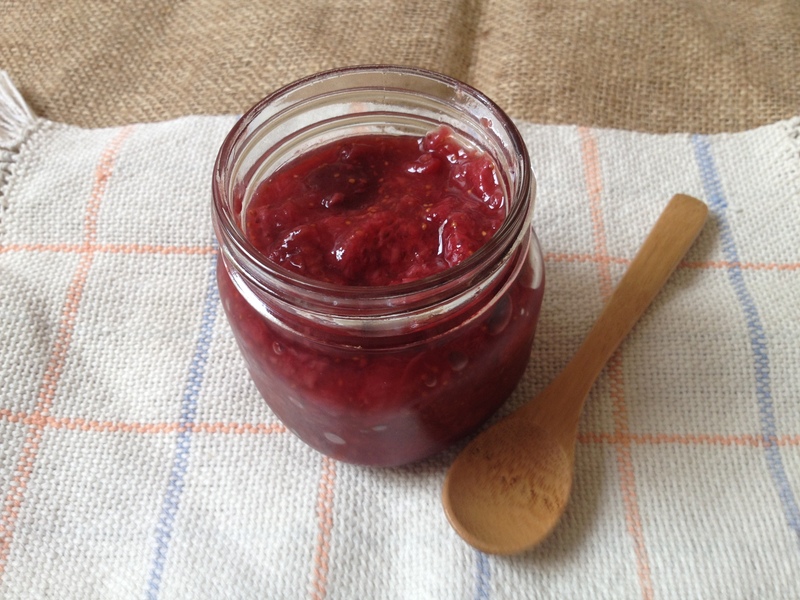 This compote stays good at least a week in the fridge in an airtight container. 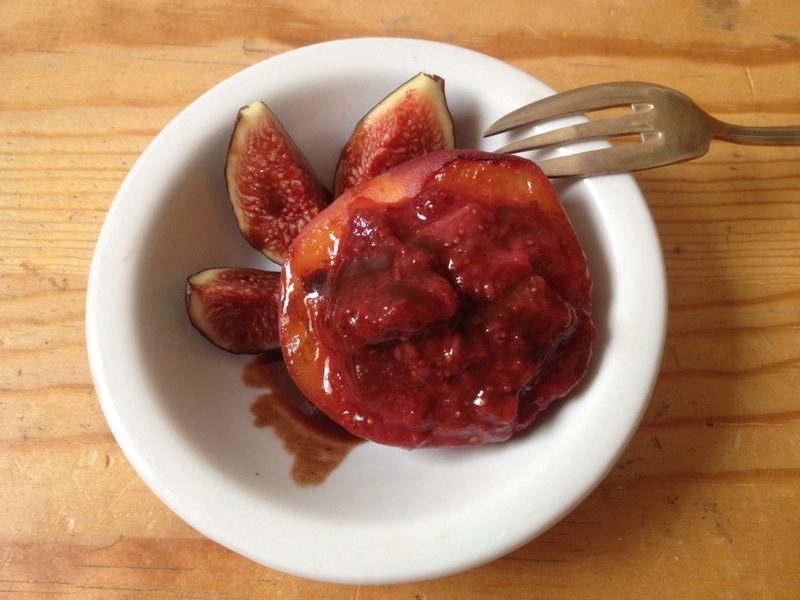 Not only is this compote delicious on it’s own, but it is so versatile also! Here I pan roasted peaches in light coconut oil and stuffed them with some fruit compote then drizzled it with chocolate sauce. 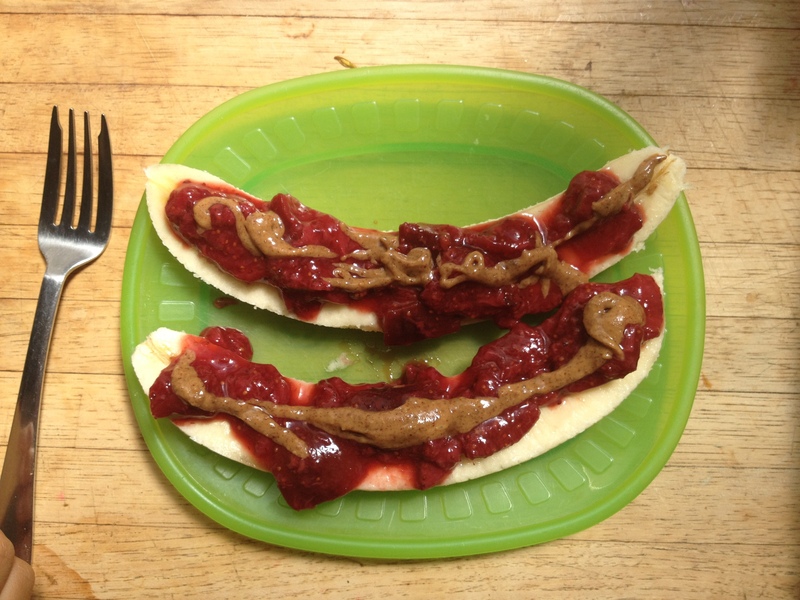 And this one time my daughter wanted a banana split and we ended up making this with the compote and some almond butter. 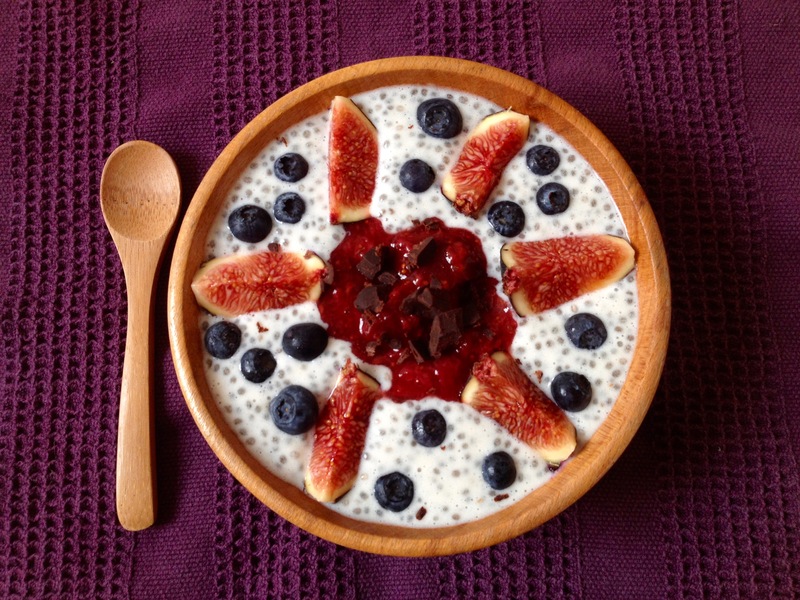 Or this yummy basic chia bowl with fruit compote and homemade chocolate chunks. We’ve also used this compote on rice cakes, toast and sit reed in oatmeal. IMPORTANT: let sit for a few minutes and blend on low for a couple seconds, do this a few times. You’ll start seeing the chia seeds floating around in the milk and staying there, that’s what you want. If you skip this step you will end up with a pile of chia seeds at the bottom of your dish and the milk on top. 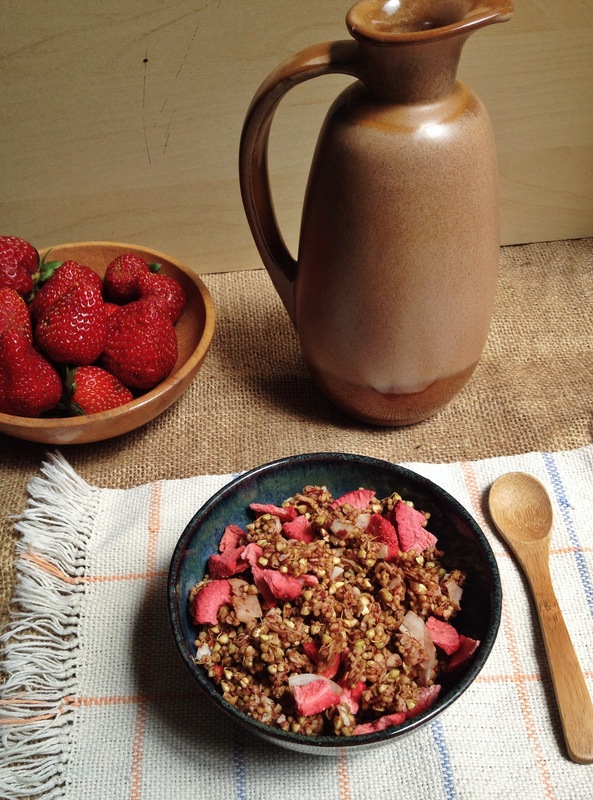 Nice and crunchy, light and flavorful, what better way to satisfy a sweet craving than with a bowl of home made (almost raw) granola? In all honesty I can find (and have found!) dozens of others ways to satisfy a sweet craving very satisfactorily but this a great way as well. 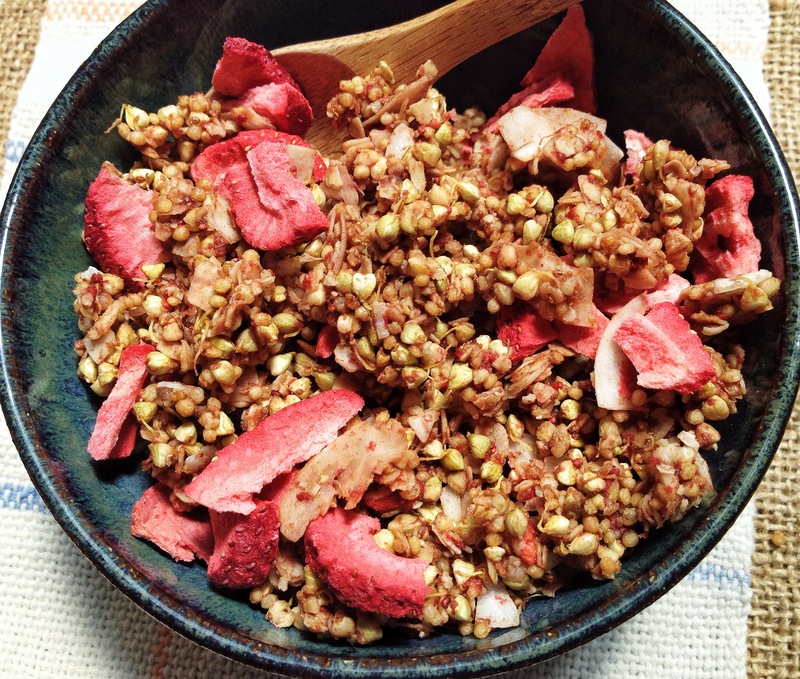 Thanks to the sprouted buckwheat base, this granola is filling without making you feel heavy, gives you loads of energy without any nasty sugar crash and fuels you with beneficial vitamins and minerals thanks to all the beautiful ingredients. I used lucuma powder, which is a fruit, and has a significant amount of potassium, calcium (good for strong bones and teeth) and phosphorus (important for bone and protein formation as well as proper digestion and hormone balancing). It also has a good amount of protein (4 grams per serving) as well as fiber. The coconut provides you with a nice dose of healthy fats. Pair this with a cup of some freshly made almond milk and you got yourself a wholesome, nutritious, delicious meal! Thanks to the strawberries, the kids love this one, and we have been eating it on homemade raw yogurt, with milk and sometimes just straight out of the jar. 3 cups buckwheat, either sprouted, or soaked at least 8 hours then rinsed really well. store in an airtight container for weeks! Or if it’s like at my house, this will only last several days…. No dehydrator? No problem! Just put it in the oven on the lowest setting and check it after 45 minutes, toss it and leave it for a while longer until it is fully crispy. I estimate it taking about 1.5 hours.